Save 10% Off on Christmas Collection! Save 10% Off on Any Product from Christmas Collection. No minimum required. Use coupon code: COLLECTION10 at checkout. Get 10% Off on Christmas Gift Baskets! Be The First To Grab 10% OFF on The Gorgeous Christmas Gift Baskets. With coupon code: BASKET10 at checkout. Take $5 Off - Exclusive Christmas Gifts! Buy any Christmas gift worth $39.99 or more and receive $5 Off. Offer valid only uptil Christmas. Use coupon code: GIFTFIVE at checkout. Special Deal - Get $10 Off on Christmas Gifts! Special Deal - Send Christmas gifts worth $59.99 or more and avail $10 Off instantly. Offer valid only for Christmas. Use coupon code: GIFTTEN at checkout. Christmas Special - Purchase any Christmas Gift Basket, Chocolates or Gifts worth $100 and Get $15 Off Instantly. With coupon code: SPECIAL15 at checkout. Save 15% OFF on All Anniversary Flowers!! Anniversary Flowers Are The Best Way to Say "I LOVE YOU". Save 15% OFF on All Anniversary Flowers!! With coupon code: LOVEU15 at checkout. Save 10$ OFF on Our Birthday Flowers and Gifts!! Save $10 Off on Our Birthday Flowers and Gifts!! Amazing Birthday Flowers and Gifts Online That Are Preferred Around The Globe. Save $10 Off on $59+. With coupon code: 10FORBDAY at checkout. Save 15% on Our Wide Range of Flower Collection!! Save 15% on Our Wide Range of Flower Collection!! Flower Combos, Carnations, Lilies, Tulips and Many More, Site Wide No Min. Shop Now. Use coupon code: FEB15 at checkout. Enjoy World Wide Free Shipping. Site Wide No Min.... Get Free Shipping on All Flowers and Gifts across 184 Countries World Wide. Shop Now. Use coupon code: FREESHIP15 at checkout. Save 15% OFF on Christmas Cakes! Save 15% OFF on Christmas Cakes! With coupon code: FAB15 at checkout. Shop Now. Special Deal: Take 10$ Off on Christmas Gifts. Special Deal: Send Christmas Gifts Worth $59 or more. And avail $10 off instantly. Offer valid only for Christmas. With coupon code: JOY10 at checkout. Save 5.00$ OFF on Christmas Chocolates!! Impress your dear ones with variety of our Christmas chocolate collection and Save $5 Off on Order $39. With coupon code: COOKIE5 at checkout. Save 20$ OFF on Order $150+!! Save 20$ OFF on Order $150+!! And Surprise her with our Christmas gifts expressing your love and concern for her. With coupon code: TWISTED20 at checkout. Save 15$ Off on Christmas Flowers and Gifts! Celebrate Christmas by Saving $15 Off on $99 on Flowers and Gifts expressing your joy. With coupon code: FROSTY15 at checkout. Get 15% OFF on Spectacular Christmas Gifts! Get 15% OFF on Spectacular Christmas Gifts Collection. No minimum required. Use coupon code: FAIRY15 at checkout. Save 12$ OFF on Orders 79$ or More!! Save $12 Off on Orders $79 or More. Select from our delicious Christmas Cakes, Branded Wines, Personalized Gifts & much more. Use coupon code: 12STARS at checkout. Save 8.00$ OFF on Christmas Gifts! Save $8.00 OFF on Christmas Gifts! Send Christmas Gifts worth $49 or more and avail $8 Off instantly. Offer valid only for Christmas. Use coupon code: HOLLY8 at checkout. The Flower Experts at PickupFlowers.com help you to connect and express through flowers. 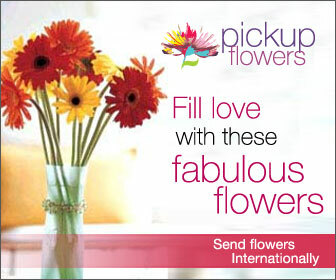 Send premium quality fresh flowers online to more than 170 countries through our international flower delivery. You can send flowers internationally using our same day and next day flower delivery service across the world. Before the Internet was considered mainstream by every household, it was very expensive to send flowers internationally. Over the last 5 years, our mission has been to make International Flower Delivery possible and make it easy and friendly. We have developed our own international florist delivery service to countries like USA, Canada, UK, Germany, Australia, Japan, Singapore, Malaysia, Philippines, India & Indonesia to deliver flowers online. To send fresh flowers, order online through the respective catalog and provide a date of delivery.